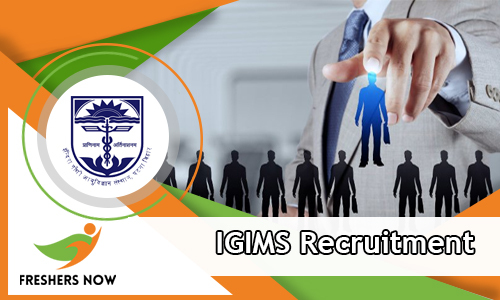 IGIMS Recruitment 2018-2019 Notification is released for 93 Professor, Additional Professor, Associate Professor, Assistant Professor, Dental Officer, Medical Officer, Casualty Medical Officer Vacancies. Indira Gandhi Institute of Medical Science is willing to hire the people who will fit the Positions correctly. Therefore, all the people who are from the Bihar State. And in Job search in Government Field can actually look up to this Notification. Well, to consider your application forms for the IGIMS Recruitment 2018-2019, all the people need to have had all the qualifications mentioned in the advertisement correctly. If not in such cases the officials of the Indira Gandhi Institute of Medical Science are going to reject the applications. Again the officials of IGIMS are going to reject the applications for IGIMS Recruitment 2018-2019 if the applicants submit the applications after the closing date. Accordingly, the final date to submit the application is 30th April 2018. So, Starting from the 23rd March 2018, all the people can apply for the IGIMS Recruitment 2018-2019 Notification. And before applying for the Vacancies, an individual should be aware of all the details. If not they might face the disappointment, as the officials will not consider the mere fulfillment. As per the data that is stated in the official IGIMS Recruitment 2018-2019 Notification, all the applicants primarily need to have the correct qualification. Now, those people who are applying should have finished their MS/MD in relevant Specialization from any recognized institute or University in India as Educational Qualification. All the people should note that the Qualification will differ for the position to position. And for the Post-Wise Educational Qualification, kindly check the official IGIMS Recruitment 2018-2019 Notification attached at the bottom of this post. Willing to find out more other details? then check further to get the information. In the official IGIMS Recruitment 2018-2019 Notification, you will find another set of requirements too apart from the educational Qualification. So, all the people who are interested in applying for the IGIMS Recruitment 2018-2019 should also know them at first. According to the data in the official notification, all the people who are interested should have the correct age along with the correct educational Qualification. Now, based on the information in the IGIMS Recruitment 2018-2019 Notification, all the people need to have the minimum age of 37 years. While the officials of the Indira Gandhi Institute of Medical Science has asked the contenders, to have the maximum age of 50 years. And there is even Age relaxation applicable. For that information, check the Advertisement. Now, next important thing all the people should aware of is Application Fee. While the officials of the Indira Gandhi Institute of Medical Science clearly mentioned about the application fee in the IGIMS Recruitment 2018-2019 Notification. Accordingly, all the people who are General and OBC Category should Pay Rs. 500/-. But the SC/ST People are exempted to pay Rs.125/- as the application fee. Please check the official IGIMS Recruitment 2018-2019 Notification before paying the Application Fee. And next after submitting the application form for the IGIMS Recruitment 2018-2019 by paying the application fee, the officials will ask the people to attend the Recruitment Rounds. Accordingly, the people who are eligible, and apply before the final date have to attend the Interview. Now, the performance in the Interview will be taken into account while hiring an individual. So, the selected people are going to get the Salary that is already offering by the officials of the Indira Gandhi Institute of Medical Science. Accordingly, the salary will differ for position to positon. Check below for the post wise salary details. MD/Ms in relevant specialization from any recognized institute or University in India as the Educational Qualification. Casualty Medical OfficerRs. 9,300-34,800, Grade Pay: Rs.5400. Check the official site of the Indira Gandhi Institute of Medical Science at igims.org. Read the instructions given in it. So, our team from the Freshersnow.com hope that the information given on this page about the IGIMS Recruitment 2018-2019 is sufficient for you all. For more such fast updates and Notifications, check our site on regular Basis.